It is difficult to pass by La Baguette and not notice it, and all the more difficult for me not to jump down from whichever vehicle I’m on and rush in for the smell of fresh bakery that lingers in the air and that piece of almond croissant that keeps calling out my name. 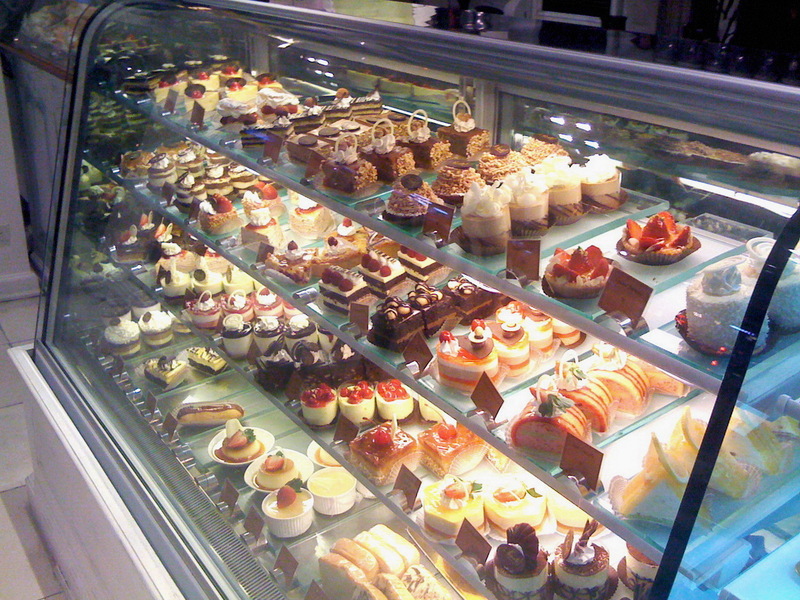 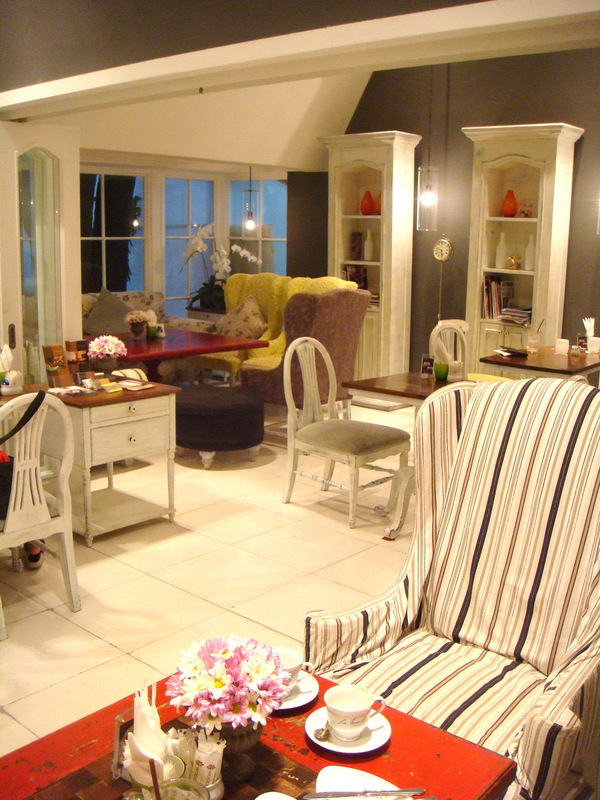 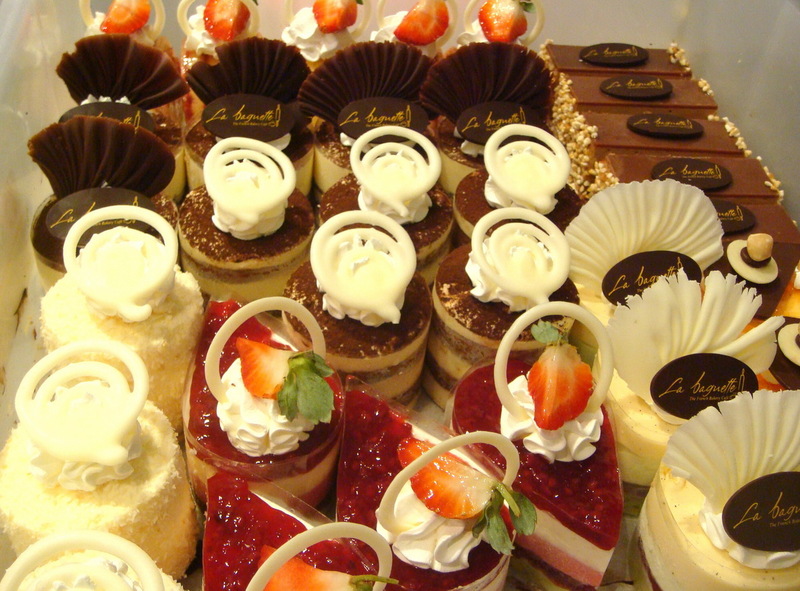 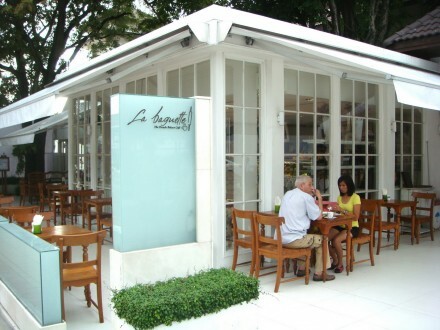 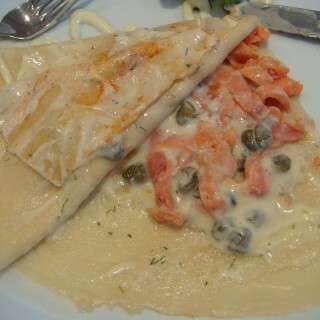 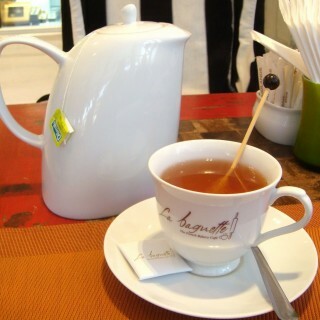 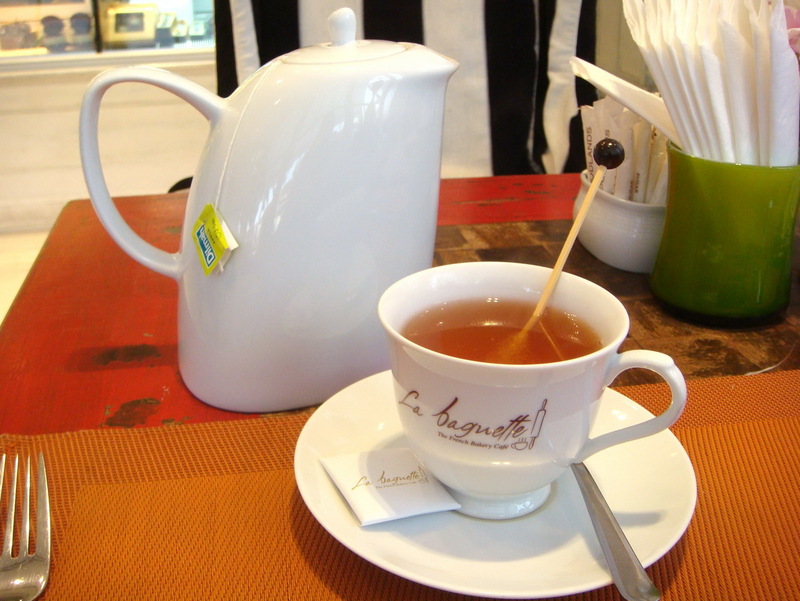 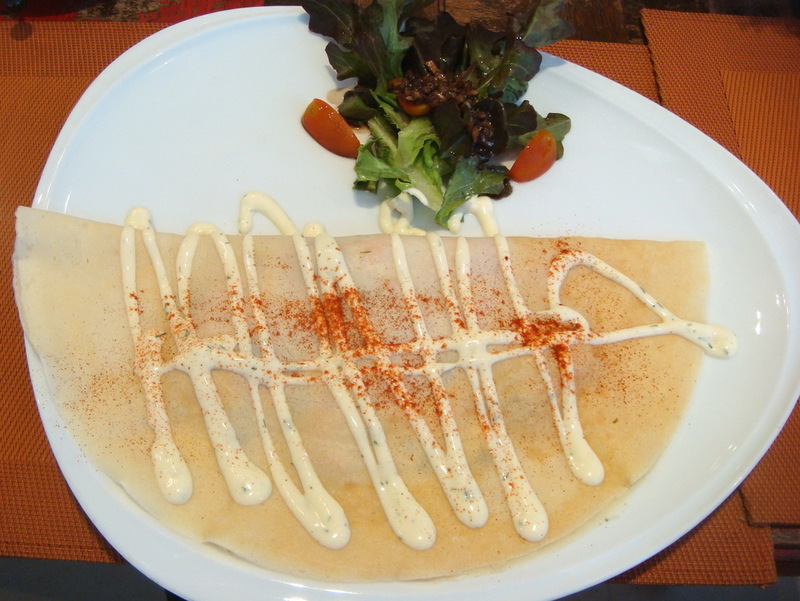 La Baguette is located in front of The Woodlands Hotel in North Pattaya. Always spoilt for choice, you will often find me there as I ogle at their wide range of mouth-watering cakes and desserts on display, which are so not fickle-mind-friendly and also just layers of love handles waiting to happen. 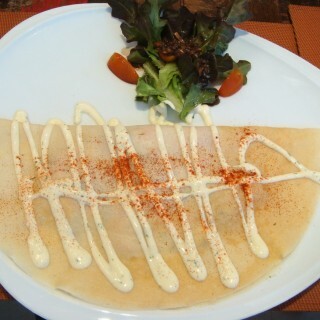 I have also tried the Norwegian Crepe. 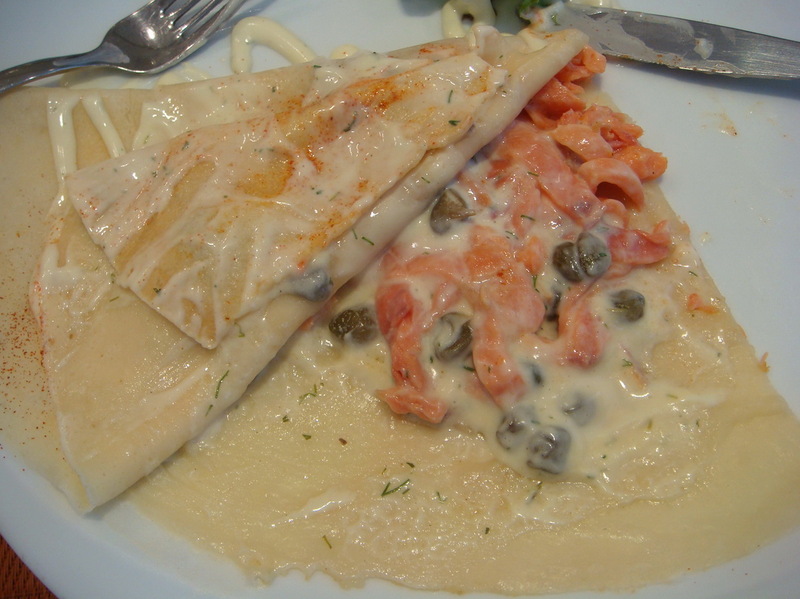 What lies beneath is the pride of Norway, being smoked salmon of course, seasonsed with some capers, lemon, chives and sour cream. 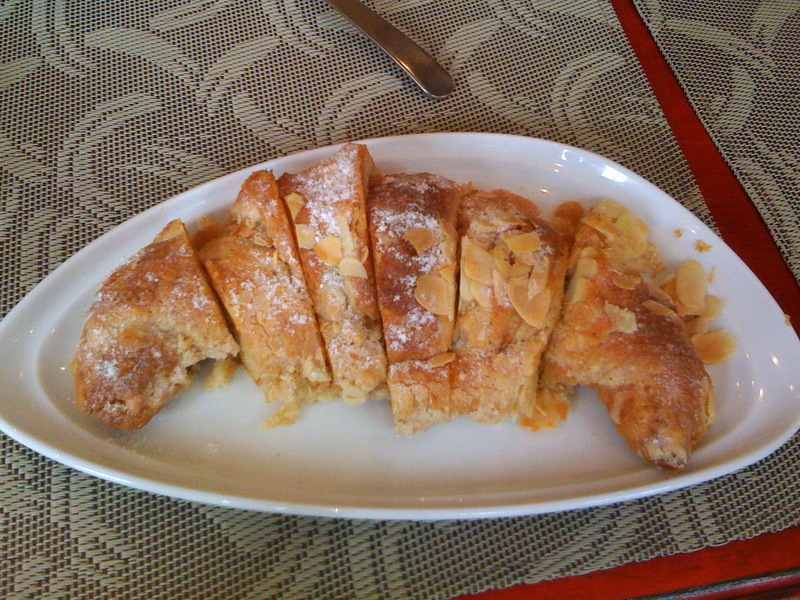 And the essence of this place, the jewel in its crown, behold (drum roll please) happiness on a plate – the Almond Croissant. 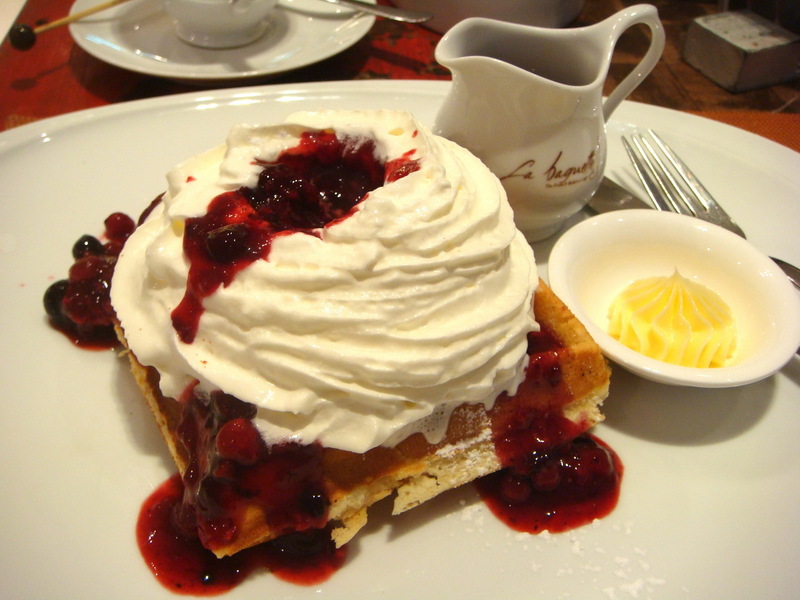 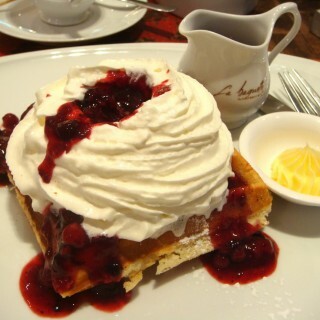 The raspberry bliss waffle is topped with plenty of fresh berries and a truly generous amount of whipped cream, which steals the waffle’s thunder. 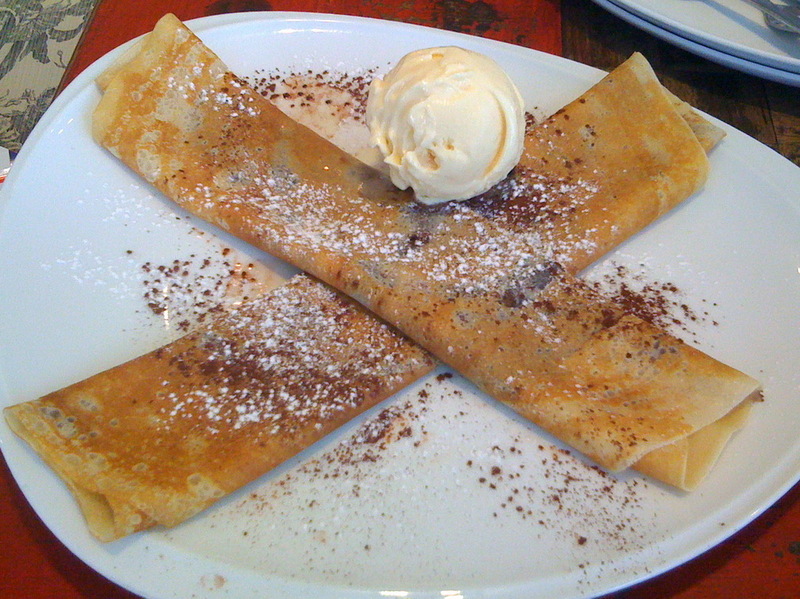 Not on their menu but definitely on mine – Nutella Crepe with a scoop of Vanilla ice cream. 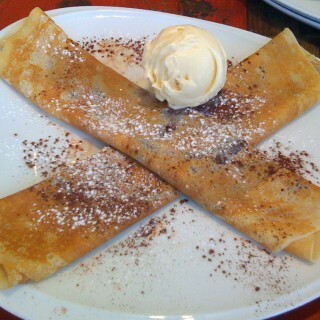 So delicious that it’s wrong; the crepes themselves seem to agree with that cross sign. 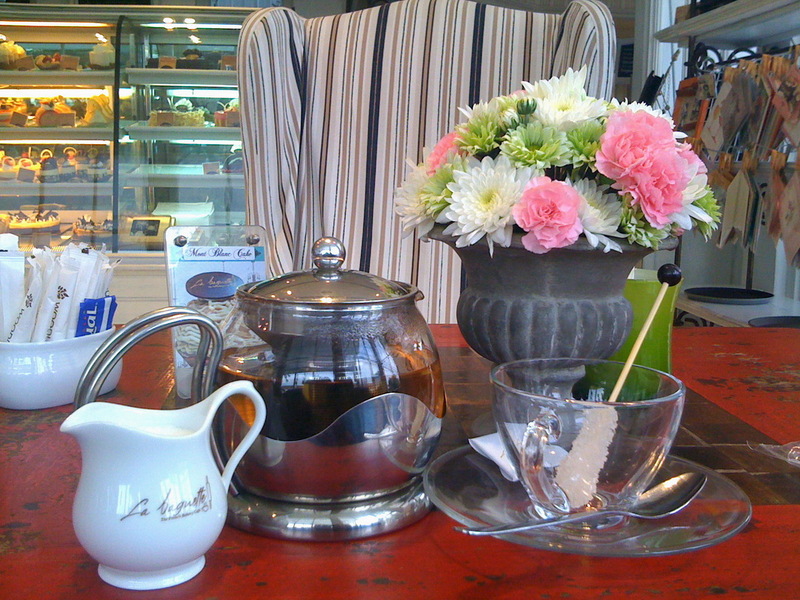 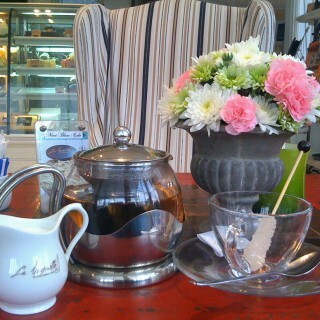 They also have aromatic teas and I usually opt for apple or peach. 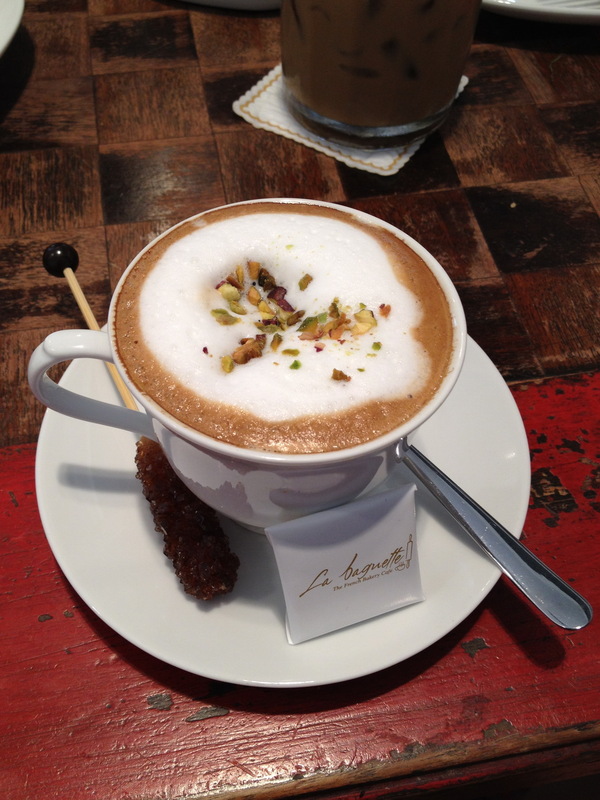 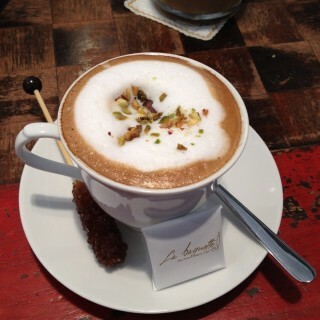 Coffee-lovers would enjoy the nut cappuccino here. 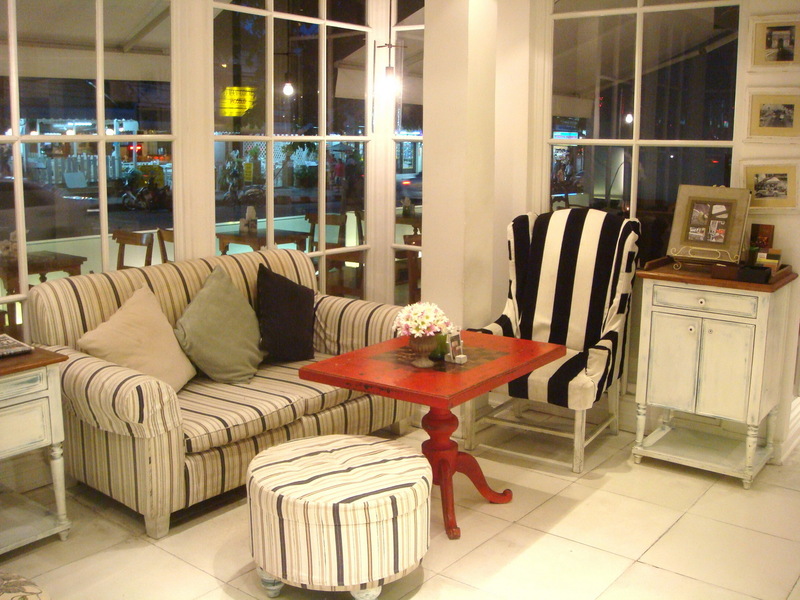 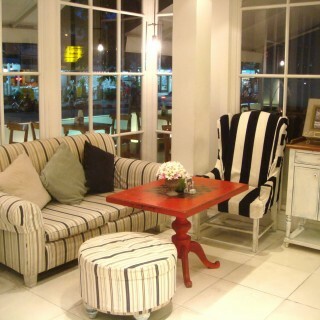 The place is filled with trendy and comfortable sofas and the décor is mostly white on the inside too, so the occasional red table provides a nice contrast. 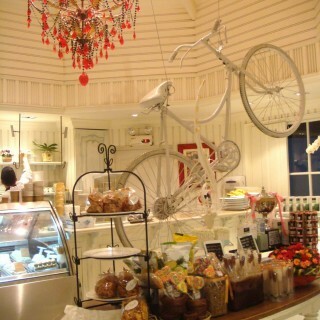 As you enter the café, there’s a bicycle suspended from the ceiling. 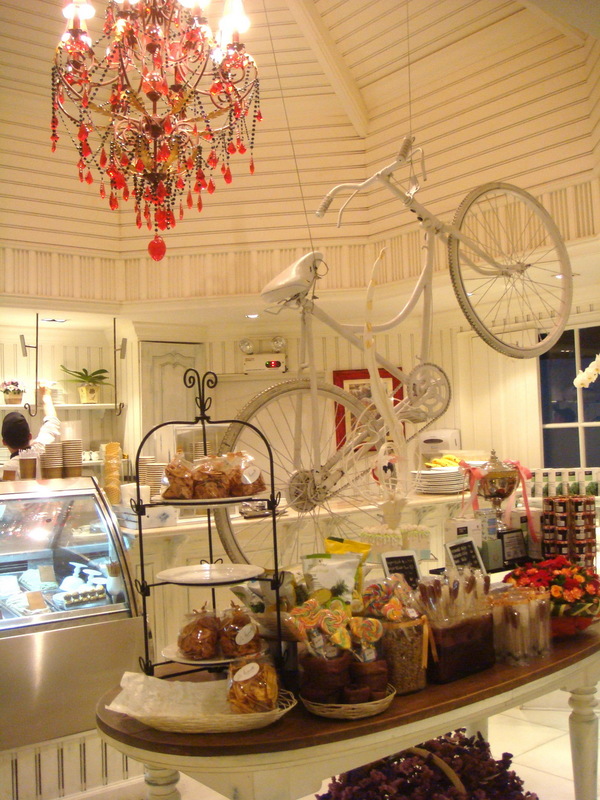 Upon leaving, I get that perhaps it serves as a sign; that you are probably going to need a lot of exercise after eating so much! 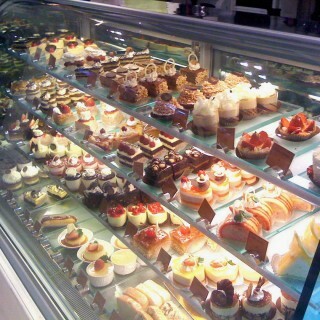 This is just so lovely! 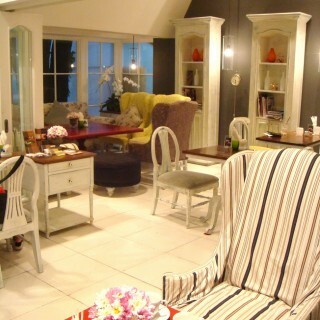 I so enjoyed the post!